I guess if I were a serious blogger, I would have had this written last Monday. I was seriously tired, however, so it's taken a while to pull this together. 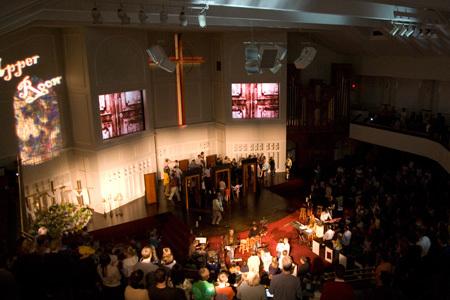 Holy Week at CPC/Upper Room is a busy time. From the Monday after Palm Sunday to Easter, we held 12 services. Thankfully, I only had direct involvement in four of them. They were big ones, though! The walk-in look for Tenebrae. The Ring of Fire was a challenge to rig safely. 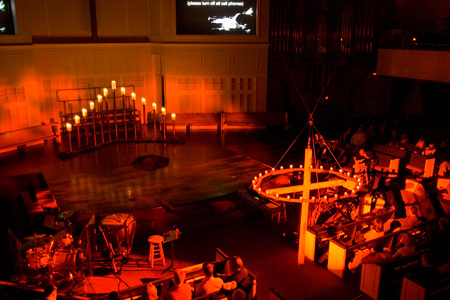 On Good Friday, Upper Room hosts a program called Tenebrae (which means "darkness"). People enter and exit in darkness and we use light very sparingly. It's a bit ironic that for our "darkness" service we bring in 6 Martin Mac700s, but having the ability to move and focus light is critical. The service is very dramatic and includes video elements, community prayers, a choir, over a dozen anointers, cross carriers and candle snuffers. All told it takes over 100 people to pull the service off. Choir and Anointers in position. In the past, keeping the elements moving in time has been a challenge, especially cuing the cross carriers, snuffers and the Christ candle carrier. To make things go smoother, we decided to try using in-ear monitors for those key roles. By putting IEMs on the key participants, and a wireless mic/e6 combo on our creative director, he was able to cue everyone at the right time. In this service timing isn't everything, but it's a big part of it. And this year, the timing was great. 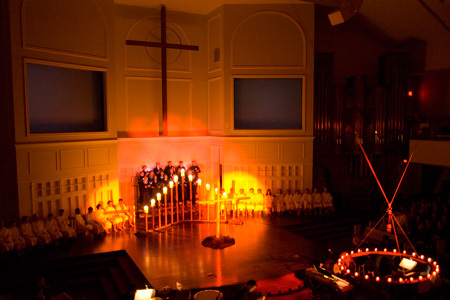 During one of the more moving (and complex) elements, the cross carriers remove the cross from it's on-stage stand and pass it out in the congregation. 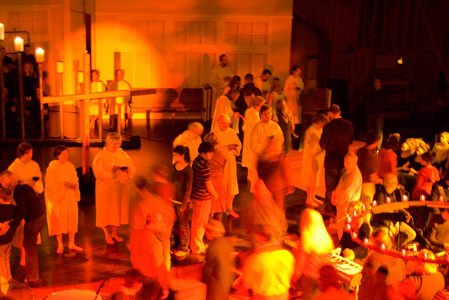 As it flowed over people's heads, it was really moving to see individuals reaching out to connect symbolically with the death of Christ. The challenge in the past has been keeping track of it and cuing the cross carriers to reign it in and help it move from section to section. With the IEMs, they could be directed really well, and totally discreetly. It worked pretty sweet. Hundreds were anointed and blessed during the service. Overall, Tenebrae came together wonderfully. 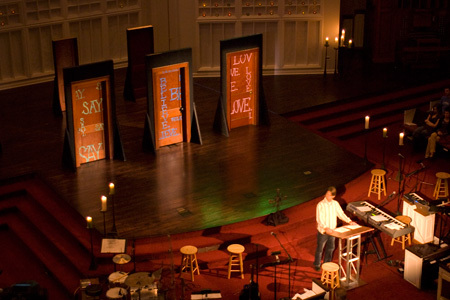 Our Upper Room Director, Kurt, told me that it was the most seamless Tenebrae we've ever had. Since it was my first one, I can't compare to others, but I felt very good about it. My goal is always to create an atmosphere of worship, and not call attention to technology. I think we were able to do that, do it well, and allow people to come into a deeper understanding of what Good Friday is all about. Honestly, it was a lot of work, but it was also a huge privilege. At the end of the night I thought of E.V. Hill's great sermon, "It's Friday, but Sunday's Coming!" True enough, two days later we were back again for a serious celebration. I've been to 18 Easter weekends since becoming a Christ-follower, and this one was totally unique. The theme of the night was "I AM the Door." We had some very cool doors on stage, three of which key words on them. We lit the doors with a spotlight each so they popped off the stage. Kurt's message was right on and asked people to consider where they were in their relationship to Christ. At the end they were invited to walk through the door that most closely matched that relationship. Just exploring? Head through the "Say" door ("Who do you say I am?") Committing to follow Christ? Walk through the "Believe" door ("Martha, just believe.") Wanting to follow Christ more? "Love" ("Do you love me?"). During the final worship set, hundreds of people walked through doors and worshiped their hearts out. It was amazing to see a huge crowd on stage dancing and singing at the top of their lungs. It was a serious party. And of course, the Mac700s from Tenebrae were there; this time swooping wildly over the crowd. It was very cool. All in all, the week was exhausting, but great. Best of all, I have some time off in the next few weeks to rest up and begin the next phase of our tech team development. As always, there's more to come!